Adults these days. They can't get enough Pokemon Go, coloring books ... and summer camp? At age 29, I shipped myself off to camp for the first time ever. 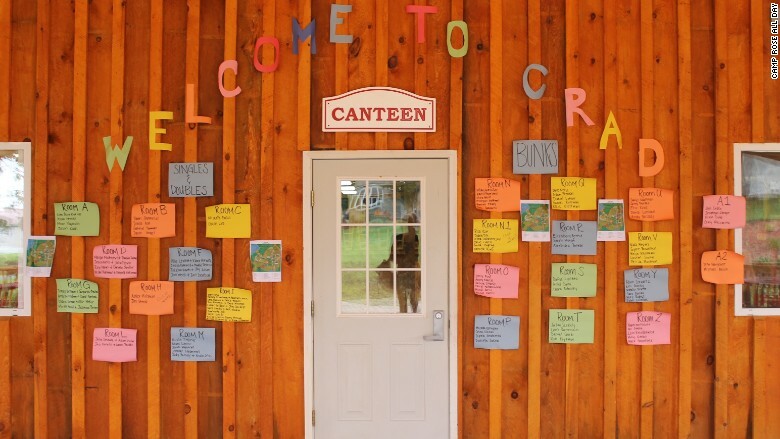 Camp Rosé All Day -- or CRAD -- is one of many adult camps that have popped up in recent years. The promise is a weekend of worry-free, childlike fun -- without the distraction of technology. CRAD bans wifi; other camps take away your phone entirely. "You take these sceney people out of their element and help them let loose. You don't have to plan anything or think about anything -- and it's a fraction of the cost," CRAD co-director Michelle Booso told CNNMoney. 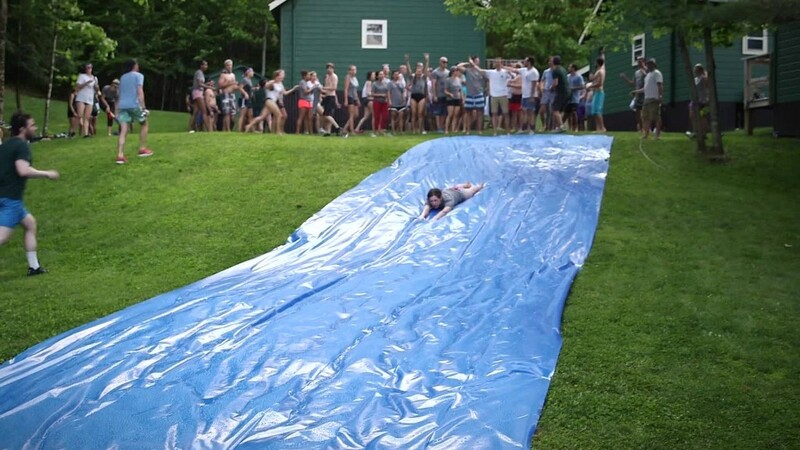 At Camp Rosé All Day, 150 twenty- and thirty-somethings voluntarily spent the weekend at a literal children's camp in the Poconos. 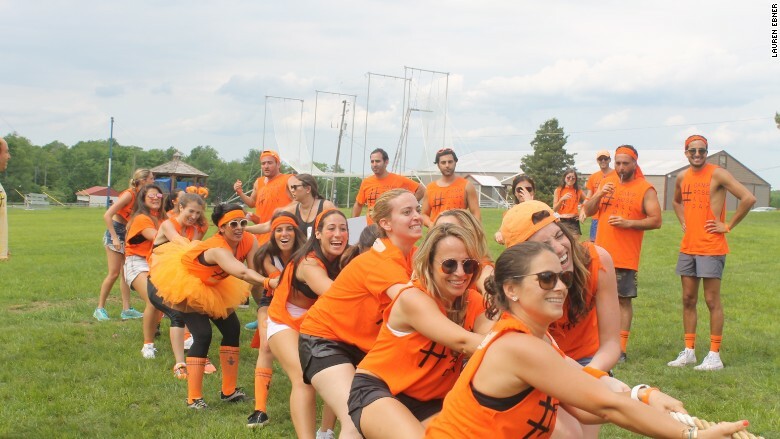 We did all the things kids do at camp, including competing in a Color War, which had us forming human pyramids, playing dodgeball and tug-of-war, and reciting team cheers. During the evenings, we dined on cafeteria food and wore what we were told: One night that meant I channeled my inner Kelly Kapowski for a '90s theme, the next night I donned all white for a "White Party." Free time was spent on tennis courts, at the pool, playing volleyball, waterskiing, trapezing, meditating or doing yoga. Referees were hired to police the Color War -- and lifeguards blew their whistles at adults misbehaving in the water. I asked the lifeguard if there were any differences between surveilling swimming adults and kids. "Adults don't listen," she said. Oh, and all the activities could be done with a glass of rosé in hand. The camp, which runs $450 to $1,500 depending on when you buy tickets and how many people you're willing to bunk with, is billed as a place "where fit meets fun meets fab." The majority of attendees are from the New York area, but some came from as far away as South Africa and Australia. For now, CRAD is an invitation-only event. Booso and co-director Chloe Lob will host two more this summer and they're already thinking about doing off-season CRAD events. 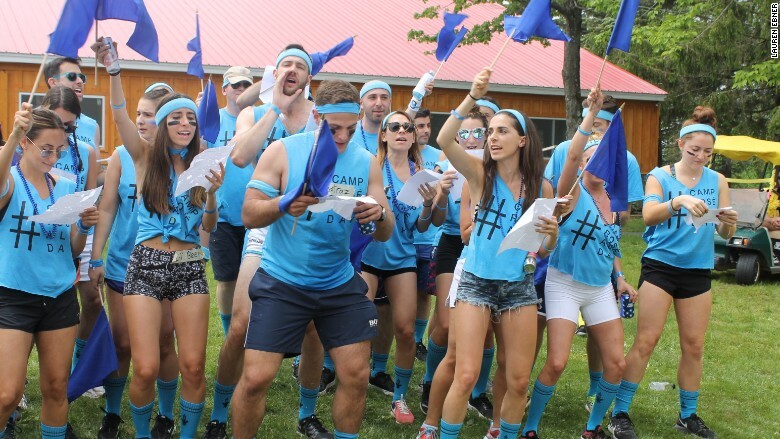 The Blue team was crowned the winner of CRAD's Color War. Getting adults to abandon their routines doesn't come without a lot of hard work on the part of organizers like Booso, who said she visited 30 camps to find the right locations. 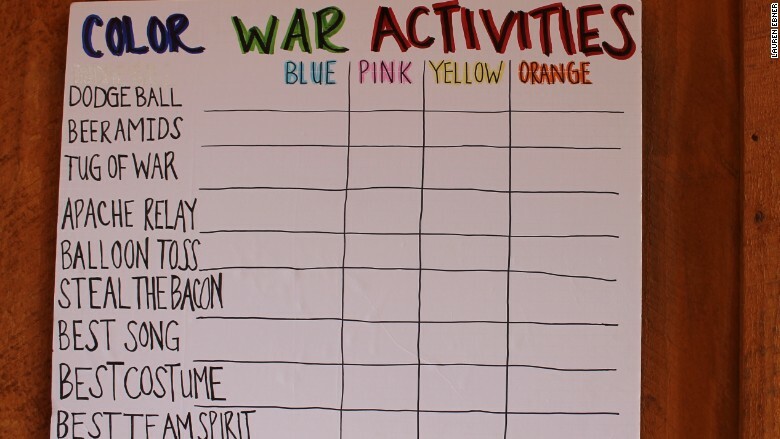 There's a lot of planning that is involved in making sure camp is fun for everyone. Booso, who hosted her first CRAD camp last summer, has Color War team leaders sending out emails weeks in advance to foster team spirit. "Make sure you rest up because we mussssst win! We are asking you to give 100%, we are asking you to give everything you got! Bring your A GAME!" read one email. We were reminded to load up on items that were in our color: "Pink tattoos, pink boas, pink leis, body paint," the suggestion list read. We were assigned cabins (apparently most men requested co-ed bunks, while women wanted female-only). Mine consisted of four guys and two women; our names were scrawled with markers on construction paper and taped to our cabin doors. No one locked the doors all weekend. We were warned ahead of time not to "expect bedding from the Four Seasons." Booso, who lives in New York City, works to get companies to donate products and sponsor the getaway. White Girl Rosé Illy Coffee, Skinny Pop, and Me Undies wanted in on this particular weekend. According to psychotherapist Nancy Colier, the increased popularity of adult camps makes sense when considering how addicted most people are to technology. "More and more, we are longing for places that put us in one experience," said Colier. While suntanning on the dock at CRAD, one camper noted how refreshing it was to look around and see people talking to each other: "Isn't it nice to see no one looking at their phone?" he said. "People want to touch real community versus virtual community," added Colier. CRAD isn't the only camp taking advantage of that sentiment. Camp No Counselors -- which hosts camps in 10 cities in the U.S. and Canada -- appeared on Shark Tank earlier this year. While they didn't strike up a deal, Barbara Corcoran was into the idea. "[Campers] don't have tech as a temptation," said Brady Gill, director at Camp Grounded, another player in the adult camp space. Camp Grounded requires campers check their phones upon entry. The camp started in 2013 with the intention of helping adults "get back to that childhood space, where we felt like we were our best, most playful, authentic selves," said Gill. The camp, which runs $700 for the weekend, will be held in California, New York, North Carolina and Texas this year. "More and more, we're living in a world where people are losing their ability to -- or the opportunities to -- play and connect with each other," Gill said.